Also, Debussy: La damoiselle ellue; Britten: Les illuminations. 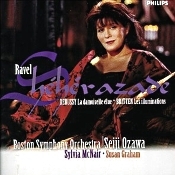 Sylvia McNair; Susan Graham; Seiji Ozawa, Boston Symphony Orchestra and Tanglewood Festival Chorus. Philips 289 446 682-2. The three song cycles assembled on this 1999 Philips release are voluptuous and sensitive, even if the musical setting for Britten's collection of short poems is in a somewhat less ethereal world than the other two. The highlight, as one might expect from its greater popularity, is the opening composition, Maurice Ravel's Sheherazade. Inspired by the impressionism of Debussy, Ravel's Sheherazade inhabits a far different landscape than Rimsky-Korsakov's earlier, more literal series of tone poems. The Ravel is all shapes and shadows and sinuous lines. Debussy's early piece La damoiselle ellue is likewise more figuratively evocative than literal. It is based on the verses of British poet and illustrator Dante Gabriel Rossetti describing his painting of "The Blessed Damozel," and adds to the mix a chorus with soprano narration. 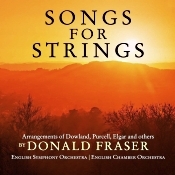 In some ways it is more lyrical than the Ravel and equally atmospheric. English composer, conductor, and pianist Benjamin Britten's Les illuminations is the newer of the three works, the composer having completed it in 1939, based on poems by French poet Arthur Rimbaud. It is the most eclectic of the written compositions represented here, and, appropriately, the musical accompaniment is the most varied, from serene and seductive to almost raucous by turns. To suggest that all of this music is quite sensuous and sexual in nature would be an understatement. 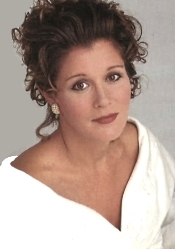 American opera and Broadway soprano Sylvia McNair sings the title roles expressively yet without fuss. They are reasonably straightforward renderings that allow the songs to breath in their own right. Some listeners may prefer more dramatic, perhaps even more sensitive, readings, but no other interpretation, I'm sure, captures the simple beauty of the poetry any better than these. Maestro Seiji Ozawa's accompaniment, likewise, is unobtrusive, serving only to reinforce the mood and never drawing attention to itself, while the Boston Symphony play with a velvety smoothness. The Philips sound is slightly dark, with Ms. McNair clearly at stage front. There is good orchestral depth, a sometimes soft high end, and little need for extended dynamic impact or a sweeping frequency range. The recording does not sparkle, but it doesn't need to. The singing and phrasing sparkle enough. Also, Overture to The Marriage of Figaro. 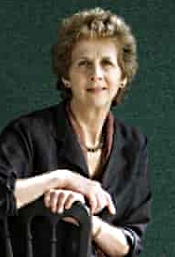 Jane Glover, Royal Philharmonic Orchestra. RPO 204404-201. 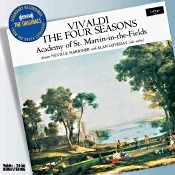 About twenty years ago, seeing the need for good, reasonably priced classical recordings--an area the Naxos label had already cultivated--the Royal Philharmonic Orchestra embarked on a project to provide the public with just such low-cost material. With an initial catalogue of over fifty basic repertoire items on the Intersound/Tring label, the RPO enterprise did very well for itself. Today, one can still find most of the material on other labels, like Planet Media and the RPO's own Masterworks. Certainly, there was no question about the RPO organization's credentials, the orchestra founded in 1932 by conductor Sir Thomas Beecham. 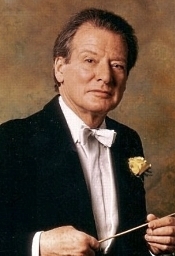 At the time of the project's inception, 1998, it's patron was Her Majesty Queen Elizabeth; the President was Lord Menuhin; the Music Director was Vladimir Ashkenazy; the Principal Conductor was Yuri Temirkanov; the Associate Conductors were Sir Charles Mackerras, Vernon Handley, and Gennadi Rozdestvensky; and the Composer in Residence was Sir Peter Maxwell Davies. Whew! That's quite an assemblage. The RPO's various recordings selected for initial release were conducted by the aforementioned people, plus by Paavo Jarvi, Mark Ermler, Barry Wordsworth, James Lockhart, Raymond Leppard, Yuri Simonov, Jean-Claude Casadesus, Jane Glover, and others. So you knew going in that this whole venture was of the highest order. I sampled half a dozen of the RPO organization's first releases in the then-new series, recorded between 1993-1996, with five different conductors. Of the six recordings, the one I was most fond of and can recommend without hesitation is Jane Glover's disc of Mozart's last two symphonies, Nos. 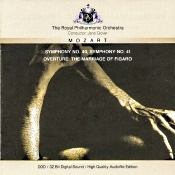 40 and 41, and the Overture to The Marriage of Figaro. Leading an RPO trimmed down from its normal complement of ninety-odd players to an ensemble of about half that size, Ms. Glover provides fleet, unmannered interpretations of all three Mozart works. Her tempos are brisk but never breathless; she indulges in very little rubato; and she keeps her dynamic contrasts at a minimum. She sticks closely to the printed page, offering performances more in accord with the practices of period instruments groups than of large, twentieth-century orchestras. You will find here none of the grand Romanticism or personal idiosyncrasies of a Karajan, Klemperer, Jochum, Bernstein, or Bohm. The readings are more on the order of Daniel Barenboim's old recordings with the English Chamber Orchestra for EMI in the late Sixties. The emotion is derived from the clean, unforced energy Ms. Glover delivers throughout. The sound, recorded at All Saints Church, Petersham, Surrey in 1993, is likewise clear and straightforward, with good definition and respectable stereo imaging. There is not a lot of weight in the bass, but that may be a boon for audiophiles who often don't want much bass overhang to interfere with the transparency of the midrange, anyway. Besides, this music does not cry out for mass so much as it does for lithe power, which is what the sonics deliver. The other discs I auditioned in the series included Rimsky-Korsakov's Scheherazade, with Barry Wordsworth, which I thought a notably tidy recording. Bizet's Carmen Suites, with Mark Ermler, was energetic and flavorful, and comes coupled with Grieg's Peer Gynt Suites. Berlioz's Symphonie fantastique, with Sir Charles Mackerras, seemed rather pedestrian by Mackerras's standards; its sound is lifelike if a little thin. Tchaikovsky's Romeo and Juliet and 1812 Overtures, with Yuri Simonov, built up a good head of steam in several of the pieces but offered little that I hadn't heard before. 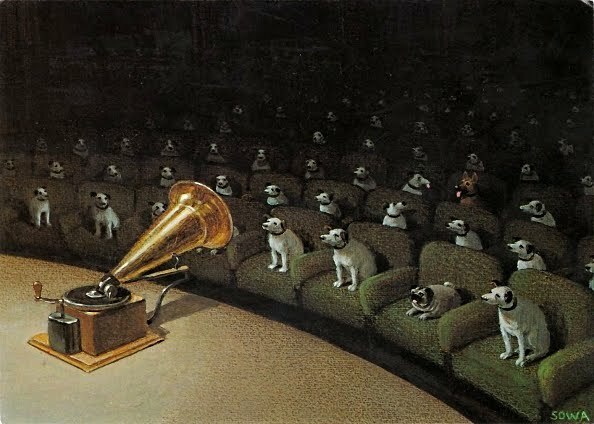 And Beethoven's Symphony No. 6, with Mark Ermler, I found a little too slack for my taste, especially when combined with its somewhat thick, muffled sonics. Overall, though, this was fine line of CDs, one that can provide the occasional gems it would be a shame for one to miss. Viktor Lukas, Lukas Consort. Naxos 8.553960. The folks at Naxos seem determined to provide us with every symphony ever composed in the 1700s in their "18th Century Symphony" series, and at a modest price who could not resist wanting them all. Like other releases I've heard in the line, this one released in 1998 is technically and artistically first-rate. German violinist, composer, and Kapellmeister Christian Cannabich (1731-1798) was yet another contemporary of Mozart who was popular in his day but whose light quickly faded into history. Mozart was apparently fond of Cannabich's composing, and especially of his conducting; he was among the few musicians Mozart praised. 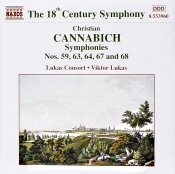 Perhaps it's no wonder; Cannabich's music sounds more like Mozart's than some of Mozart's own early works. Whatever, the present disc contains five short symphonies, each in three movements and about a quarter hour long. Why Naxos present them in the order they are in is anybody's guess, but they appear on the disc as Nos. 63, 67, 64, 59, and 68. Why not chronological? Who would really care one way or the other? One is tempted to mix and match the movements to program a new symphony of one's own--a favorite opening Allegro here, a slow Andante there, maybe a zesty Presto from somewhere else. Key changes in the pieces are pretty abrupt, anyway, and there is little or no apparent thematic continuity between movements as they are. (At least not apparent to me.) Nevertheless, the symphonies are all rather enjoyable, played with a lightness of heart by Viktor Lukas and his small Lukas Consort, a group of about fifteen strings and an assortment of solo wind players. The accompanying booklet note tells us that Cannabich himself led a rather large ensemble as the Director of the Mannheim Orchestra of his day (1774-1798), an orchestra sometimes reaching as many as ninety-five musicians and finally, because of budget restraints, reduced to about fifty-five players. 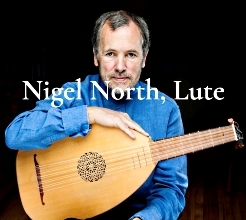 Certainly, the more diminutive size of the Lukas Consort gives them the advantage of clarity, which is enhanced by the general excellence of the Naxos recording. Also, Burleske. 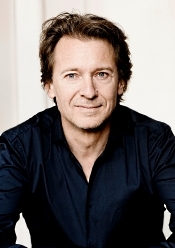 Denis Kozhukhin, piano; Marc Albrecht, Netherlands Philharmonic Orchestra. Pentatone PTC 5186 617. I've said this before many times but it bears repeating: I don't think it's such big leap from the heroic swagger of Franz Liszt's Les Preludes to the heroic swagger of Richard Strauss's Ein Heldenleben. Or from Richard Strauss's Ein Heldenleben to Erich Wolfgang Korngold's The Sea Hawk. Or from The Sea Hawk to John Williams's Star Wars. All composers owe something to those who went before them, and Strauss's Ein Heldenleben ("A Hero's Life") was a natural step in the progression of the tone poem. Richard Strauss (1864-1949), German composer and conductor, wrote Ein Heldenleben in 1899 as a mock autobiography, a tongue-in-cheek self-portrait. 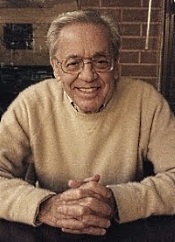 The composer was only thirty-four years old when he wrote it, proving his self-confidence in writing a musical autobiography at so early an age. Mostly, however, he seems to have composed it to defend himself against his critics, whom he silences through the music. In response, many of Strauss's critics continued their attacks on Strauss, saying his music was indulgent and narcissistic. Whatever, Strauss divided Ein Heldenleben into several parts describing the various stages in the artist's life. The first segment, "The Hero," describes Strauss himself and does so on a big, swashbuckling scale. Maestro Marc Albrecht handles it in fine if slightly perfunctory style. In other words, I would have liked more swash in that buckle. If we see the opening movement as setting the tone for the composer lampooning himself and his critics, it could have benefited from more juice doing it. Next, the music turns to "The Hero's Adversaries," obviously his critics, where we hear them squabbling among themselves in amusing fashion. Following that is "The Hero's Companion," his wife, defined by the violin. Under Albrecht the adversaries seem somewhat complacent, but the wife seems appropriately temperamental. Throughout these sections, the Netherlands Philharmonic and, I assume, first violinist Vadim Tsibulvsky as the wife, perform admirably, with a polished decorum. "The Hero's Battlefield" is where Strauss engages in all-out combat with his critics, reminding them of his (musical) accomplishments by throwing in bits from Don Juan and Zarathustra, as well as a few horns from Beethoven's Eroica Symphony. Albrecht seems to be having a good time here, never rushing things and never overemphasizing the obvious. Yet the conducting also appears rather cautious, as though Albrecht didn't want to stick his neck out too far. I wish he had done so because we already have a plethora of conventional Heldenlebens; something a touch more vibrant might have been more interesting. Albrecht wraps up the piece with the greater certainty that peace and love will prevail in the hero's life. 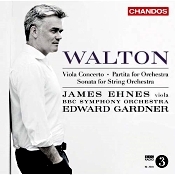 It is here that the conductor's slightly conservative approach pays off best because the music needs such a light and tender touch as he provides. 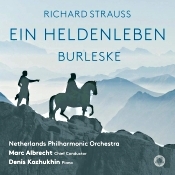 Coupled with Ein Heldenleben (and preceding it on the program as a kind of warm-up act) is the Burleske in D minor, which Strauss wrote for piano and orchestra in 1885-86 when he was still young, about twenty-one. The work had a rocky beginning. He wrote it for the pianist and conductor Hans van Bulow, who proclaimed it a "complicated piece of nonsense" and refused to play it. The piece, slightly revised, wouldn't see a première until 1890 or a publication until 1894. Even revised, it still seems like a complicated work, full of satire, whimsy, playfulness, and youthful mischief and still a handful for the soloist, especially, to negotiate. Nevertheless, pianist Denis Kozhurkhin does a first-rate job with it, and the whole affair comes off with a splendid flair. Producers Renaud Loranger and Wolfram Nehis and engineers Erdo Groot and Jean-Marie Geijsen recorded the music in hybrid SACD at the NedPhO-Koepel, Amsterdam in February (Burleske) and December 2017. You can play the disc in multichannel or two-channel SACD from an SACD player or in two-channel stereo from a regular CD player. I listened in the two-channel SACD mode. It's a good, modern recording, smooth, warm, and wide ranging. Although it probably doesn't have enough completely outstanding qualities to qualify as a stereophile recording, it makes for good, relaxed listening and satisfactorily approaches the sound of a real orchestra in a real acoustic setting. A modest reverberation defines the hall, while stereo depth and spread remain more than acceptable. I would have expected a tad more dynamic range and impact from an SACD recording, yet such minor shortcomings fail to detract much from the disc's overall sense of realism. 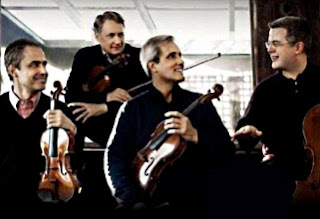 The world-renowned Emerson String Quartet celebrates the 80th birthday of American composer and pianist, winner of the National Medal of Arts, Pulitzer Prize and Grammy Award, William Bolcom at Lincoln Center's Alice Tully Hall on Sunday, October 21, 2018 at 5 PM. Joined by the acclaimed pianist Shai Wosner, the Quartet performs Bolcom's Piano Quintet No. 1. Composed in commemoration of the 80th birthday of the legendary violinist Isaac Stern, the piece was premiered in 2001 by Stern and members of the Emerson Quartet (Philip Setzer, violin, Lawrence Dutton, viola, David Finckel, cello) along with pianist Jonathan Biss at the Kennedy Center in Washington, D.C. In addition to Bolcom's Piano Quintet, the upcoming concert features the Mozart Quartet in E-flat major for Piano, Violin, Viola, and Cello, K. 493 and concludes with the vibrant and unabashedly joyful Dvorák Quartet in G major for Strings, Op. 106 of which the slow movement is considered one of the glories of Dvorák's whole catalog. Hurry! Ticket Prices to "Mozart Magnified" Go Up at the Door! Join PBO with exquisite Puerto Rican soprano Camille Ortiz and a star-studded cast as we celebrate Mozart for our season opener. With the full force of the Chorale, and the Orchestra's vibrant range on period instruments, PBO's authenticity shines brightest in simple and dramatic moments of Mozart's most glorious vocal works. It's hard to believe that fall is here, and the end of 2018 is right around the corner. PARMA has experienced a fruitful summer, with the successful launch of our China tours, dozens of innovative new releases, and recording sessions in Croatia and the Czech Republic. Now, we are looking forward to an equally exciting fall season - which includes our latest Call for Scores. In addition to being recorded, selected submissions will be considered for live performances. Previously accepted scores have been performed in Poland, Russia, Croatia, Austria, the Czech Republic, the United States, and more. 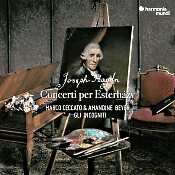 Selected scores will be recorded and commercially released by PARMA Recordings. The submitter is responsible for securing funds associated with the production, and retains all ownership of the master and underlying composition. Works should ideally be between 5 and 15 minutes in length, but pieces outside of that range will still be considered. Deadline for all submissions is October 19, 2018. There is no fee to submit. You will receive a confirmation of receipt for submissions. We will work with the performers and our Sessions, Audio, and A&R Teams to select pieces that could fit these open projects. Should your music be selected, we will reach out to you with more information on pricing, scheduling, and other details. The Music Institute of Chicago's Faculty and Guest Artist Series continues Sunday, October 28 with a 3 p.m. "Spooktacular" Concert and 4 p.m. Haunted Musical Open House at Nichols Concert Hall, 1490 Chicago Avenue, Evanston, Illinois. Using a festive Halloween theme as inspiration, the Music Institute's award-winning faculty perform appropriately "scary" music that showcases the historic 1914 E. M. Skinner pipe organ as well as a variety of instruments and musical styles. This family-friendly, 60-minute concert is followed by a "Haunted Musical Open House." Guests make their way to the lower-level Community Music School to travel from room to room for spooky music and trick-or-treating. Audience members of all ages are encouraged to wear costumes and show their Halloween spirit. The "sublimely exploratory" (The Chicago Reader) Wet Ink Ensemble is pleased to collaborate on two exciting fall projects: Nate Wooley's FOR/WITH Festival at Issue Project Room and For The People, a special event curated by saxophonist/composer Darius Jones, at Roulette. Wet Ink makes an appearance on FOR, the first evening of the FOR/WITH Festival, organized by trumpeter/composer/writer Nate Wooley, at ISSUE Project Room on Wednesday, October 31, 2018 at 8:00pm. 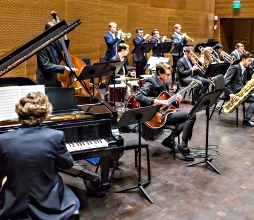 Members of the Wet Ink Large Ensemble will present the U.S. Premiere of Catherine Lamb's Prisma Interius VII. Previously staged in London at Cafe Oto in March 2018, Lamb's work is the most recent development of a series of pieces constructed around the Secondary Rainbow Synthesizer, an instrument—in development with Bryan Eubanks—that spectrally filters a live sound input of the outer atmosphere to the listening space within which the the performance piece is situated. In this iteration, the piece is staged with violin, clarinet, guitar, cello, and the Secondary Rainbow Synthesizer. On Monday, November 5, 2018 at 8:00pm, Wet Ink joins saxophonist/composer Darius Jones at Roulette as part of "For the People," a community-based event and concert organized by Jones on the eve of the November Congressional Election. The evening is centered around a collection of compositions by Jones, in collaboration with The Wet Ink Large Ensemble that upholds the belief that artists have the duty and power to inform, inspire, and empower their surrounding community. The evening includes the world premiere of Jones's Being Caged in ICE, followed by the second performance ever of America The Joke (written for Wet Ink in 2018), and concludes with the return of LawNOrder (pronounced "law no order"), a 45-minute game piece dealing with social justice and American history. Each player represents a separate character (unknown to the other players) and is handed a law to follow at the beginning of the piece. Scott Yoo, the Festival's Music Director, curates the WinterMezzo series, which showcases exceptional artists performing in intimate venues. Yoo will perform as violinist in these programs along with featured artists. Yoo is in residence in San Luis Obispo six weeks annually; he serves as Artistic Director and Chief Conductor of the Mexico City Philharmonic and he recently conducted the London Symphony Orchestra and the Royal Scottish National Orchestra in two recording projects. Yoo is also the host and co-executive producer of "Now Hear This," a music and travel television program slated to air as part of Great Performances on PBS in Spring 2019. For complete information, visit FestivalMozaic.com. The 2018/2019 school year is off to a great start. Students in our beginning violin class have been busy practicing with a wooden practice bow and finally after 6 classes it was time to trade in their practice bow for a real violin to take home and practice. On September 17 it was my privilege to assist in the distribution of violins to Ms. Chung's beginning class at the East Las Vegas Community Center. Mr. Tim Thomas assisted Ms. Johnson distribute violins to her beginning students at the Pearson Center on the same day. Students knew the day for violin distribution was that day and as they entered the classroom the air was filled with anticipation from students and parents. You can see from some of the photos that the students were elated to finally hold a violin in their hands. Parents were busy taking pictures of their child receiving their violin and I am sure they were anticipating the day that their child would soon appear on stage and perform for an audience. Our first recital for the year is scheduled for October 20. The beginning classes will not perform for that recital but they will definitely have a song or two to play on the next recital scheduled for December 8. We now have a beginning orchestra, advanced orchestra, chamber orchestra, beginning mariachi, beginning guitar/guitarrón/and vihuela, advanced mariachi, beginning cello, second-year cello, and classes for levels 1-4 violin. Our program is growing and we strongly believe it is making a difference in the lives of our FAYMsters. Many thanks to all the generous contributors to FAYM. It is your support that makes all this possible. If you like what we are doing, please share our website with friends and businesses that may also join in supporting what we do. Hal Weller, the FAYM Board, and I do our best to assure that all donations are used to provide services, scholarships, and materials for our students. 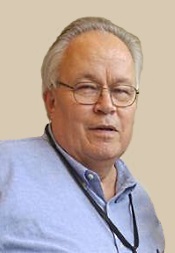 Nicholas McGegan, Music Director for the Philharmonia Baroque Orchestra & Chorale (PBO), has announced that he will retire from his leadership post at America's preeminent period performance ensemble after the 2019-20 Season; at that time, he will have guided the organization for 35 years. 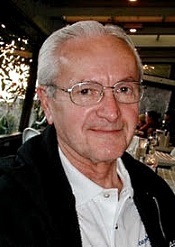 He will be designated Music Director Laureate in recognition of his many contributions to the Orchestra at the beginning of the 2020-21 season. 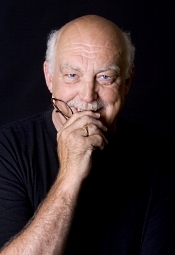 At the time of this announcement, the organization's Board of Directors, led by President Kay Sprinkel Grace, and institutional leadership will convene to begin the search for a new Music Director to build upon McGegan's legacy of programming and presenting period music at the highest level of artistic integrity. 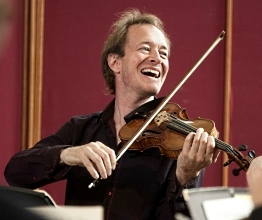 "Nicholas McGegan has led Philharmonia Baroque Orchestra for 35 years. We have benefitted from the strength of his programmatic vision, energy, and aptitude for making historic performances accessible to broader audiences," said the ensemble's Board of Directors president Kay Sprinkel Grace. 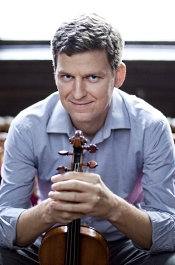 "He has embraced and advanced our mission throughout his decades of leadership of Philharmonia, and his passion for everything from early music to new works continues to propel Philharmonia to new heights. We look forward to having him remain an integral part of our future." "This certainly isn't a farewell," said Music Director Nicholas McGegan. 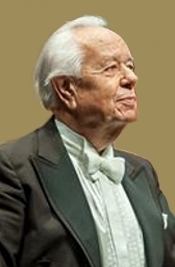 "It has been an enormous honour and privilege but also tremendous fun to work with our terrific musicians for half my life, and I look forward to many more years of performances as Music Director Laureate, with fewer administrative responsibilities. Thanks to the musicians, board, staff, donors and our wonderful audience, I've been able to realise so many of my artistic dreams, creating lots of happy memories along the way." Back by popular demand, the exceptionally gifted Mahan Esfahani returns for two harpsichord recitals featuring J.S. Bach's treasured Well-Tempered Clavier at Columbia University's Miller Theatre, NYC. Over two nights, Esfahani pairs selections from Bach's masterpiece with a world premiere commission by George Lewis, as well as contemporary works from Luciano Berio and Tristan Perich. Princeton University Concerts' popular family concert for kids 3-6 and their families, "Baby Got Bach," returns on Saturday, November 3 at 1 PM at Richardson Auditorium. Hosted by pianist Orli Shaham with guest artists the Westerlies Brass Quartet, this year's concert will focus on introducing pre-school-aged kids to the joy of live classical music. "Baby Got Bach: Bring on the Brass!" Tickets: $5 Kids/$10 Adults. Tickets are available online at princetonuniversityconcerts.org, by phone at 609-258-9220, or in person two hours prior to the concert at the Richardson Auditorium Box Office. 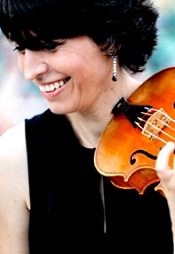 The Orion Ensemble, winner of the prestigious Chamber Music America/ASCAP Award for Adventurous Programming, continues its 26th season with "Russian Passion," welcoming guest cellist Ian Maksin and guest violist Stephen Boe. Performances take place November 11 at a new venue, First Congregational Church of Glen Ellyn, Il; November 14 at the PianoForte Studios in downtown Chicago; and November 18 at the Music Institute of Chicago's Nichols Concert Hall in Evanston, Il. For more information, visit orionensemble.org.